NADAR (1820-1910). Portrait de François Guizot. Photographie. Collection particulière. 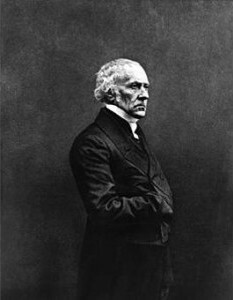 François Guizot, born in 1787 during the reign of Louis XVI, was one of the most prominent figures in France and in Europe for over half a century until his death in 1874, when Mac Mahon was President of the newly established Third Republic. A Protestant bourgeois, he was considered to be the greatest historian of his time, introducing the notion of civilization as a new topic to be studied. A philosopher, he initiated the French version of political liberalism and was considerably influenced by England, having written a history of the English Revolution. Elected as a member for Calvados in the Chamber of Deputies in 1830, he endeavoured to adapt the representative system to France, both in the Chamber and in government. As a statesman, his famous law of 1833 laid the foundations of primary school education in France and as Minister for Foreign Affairs from 1840 to 1848, he established the first Entente Cordiale with England. He was also the instigator of a genuine policy of heritage and memory. The fall of the July monarchy in February 1848 brought about the end of his political career, but he continued to have considerable intellectual and moral influence over society until the end of his life. Tocqueville, Marx and Renan all recognised how much they owed to his works. His Memoirs, and especially his vast and magnificent correspondence, the fullness of his family life and friendships, as well as his affectionate relationships with women, reveal a man far different from the caricatures that he endured but also provoked. For having either neglected or failed to recognise the democratic aspirations that his own policies had in many ways encouraged, he was seen as a defeated figure in political history. When France became a Republic, a regime he had always fought against, he was for a long time relegated to the category of a conservative blinded by his bourgeois background. However, over the last thirty years, his life and works have been reconsidered and replaced in their rightful context. This website aims at providing a set of unpublished archives and articles and to centralize all works on François Guizot. The horizontal navigation bar allows to access Guizot’s entire life, from a family, political and intellectual viewpoint. The side navigation bar provides access to additional documentation. Many videos and audio files are also available under “Conference proceedings”.